This steel prefabricated fireplace became the best solution for a senior living community where outdoor fireplaces are not allowable backyard amenities. 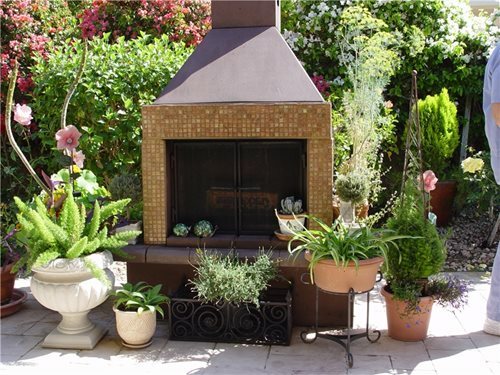 Outdoor fireplaces can be broken down into three distinct categories. Made from scratch fireplaces are constructed of CMU block or poured concrete clad in attractive veneer. A fireplace created from a kit is simply a prefabricated unfinished unit that is assembled on site and veneered. Both of these are built by contractors and require a building permit. The third fireplace is literally a portable finished unit that is set onto an existing slab or patio where it is immediately usable. Thanks to innovations in lightweight building materials such as composite concrete, fiberglass, and super thin stone veneer, these fully assembled units are delivered on a fork lift right to your house. There's no need for a contractor, but assistance in moving it to the final location may require strong laborers or special equipment. Above all, this fireplace does not demand a building permit because it's not built, but placed. The elimination of the building permit gives this amenity a whole different role in terms of regulations. They are a perfect fix for planned communities that may not approve outdoor fireplaces due to CC&R regulations. This also applies to urban homes where there may be even more stringent controls on built in fire features. It's clear that these fireplaces are ideal for instant changes in an existing landscape due to speed of installation. Unlike the other two built-in fireplaces, this one can actually be moved to a new house if you decide to relocate. That makes it a great choice for renters to upgrade outdoor living spaces without spending money improving the landlord's real estate. The way these fireplaces are sold is also very different. They're commonly available at home improvement stores and discounts there make this an ideal place to buy one. However, with the complexities of delivery and placement of the unit, selecting a seller that offers delivery and on site location of the unit as part of the package. Not all prefabricated fireplace units are constructed to meet contemporary design standards. The best choices are those that once set and accented with decorative elements and plants may appear identical to much more costly built in units. The best choices feature quality looks with stone, tile or stucco. Colors also vary from faux bluestone to stucco. Cal Flame is one brand carried by a national home improvement store chain offering elegant upscale design and detailing. These units range from about $1800 to $4,000 or higher at more pricey retail stores. Necessories makes a fireplace that is simpler, boxy in shape and more rustic looking, with square lines. It is a low end choice using tumbled concrete block for about $2000 that can be assembled by two people in about four hours. These companies also make accessories for their units such as a seating hearth and matching wood boxes for firewood to be stored adjacent to the firebox. The benefit of paying more for the same product at a high end patio store are more options for design by other manufacturers, or the ability to order yours in a specific color or detail package. 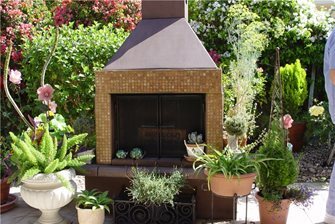 More expensive, sure, but you may get a great looking version of your favorite built in outdoor fireplace design.